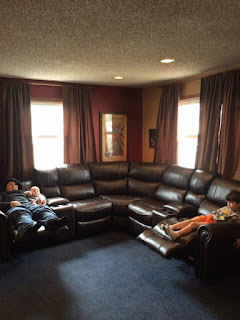 A RUP LIFE: New Couch! Our last couch pretty much broke the day we bought it. It was honestly that terrible. The fabric tore from the back and eventually the arms cracked. The last straw was one of the seats fell to the floor. 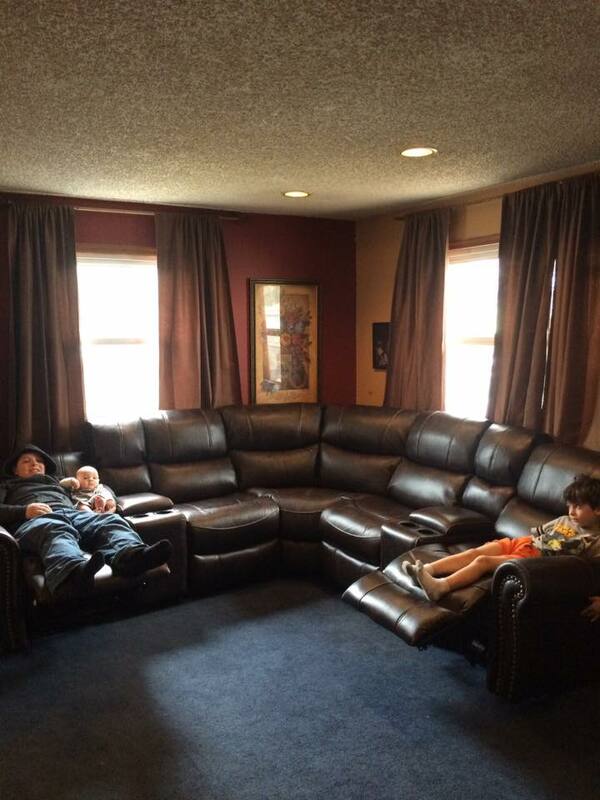 Unfortunately it took a long time to save up for a new couch because they are not cheap. This weekend we finally got our new one. I'm so happy with Bob's Discount Furniture - which is where we got it from. They have ice cream and candy for the kids. Their showroom is impressive with a lot of choices. They also have a no haggle policy so everyone gets the same deal. When the couch came I wasn't thrilled with it. It was just a tad bit too small for our big family so I gave my salesman a call and ordered another piece to add. It will be here in two weeks but I know it will be perfect. This couch has 3 recliners and two cupholder sections with storage and charging stations for your phones. It is pretty awesome. It looks like leather but it is actually polyester. So easy cleaning too. Next I want to get a lamp for the corner plus a new picture. Our little guy is 5 months old now! He is a beast at over 18 pounds and 28 inches! That outfit he is wearing my third son wore at a year!! Crazy! I love his pudge!! 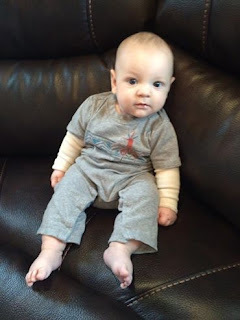 Very nice couch, and your little guy is adorable! Your baby is adorable. Love the new couch! Someday I'd like to get one similar to that.